For the last few months, we’ve been asking the Hackaday.io community for their thoughts on what the best projects are in the 2015 Hackaday Prize. We’ve also been giving away some fabulous prizes to people who have voted, and we just wrapped up the last round of voting? Did anyone win? Check out the video below. Over the last few weeks, we’ve had a lot of fun running the Community Voting for The Hackaday Prize. We’ve been offering up a $1000 gift card for The Hackaday Store to a random person on Hackaday.io if they have voted in the latest round of community voting. Unfortunately all of our weekly random drawings for someone on Hackaday.io has come up empty-handed. Now we’re changing it. Due to popular demand, someone who has voted in the latest round of Community Voting will win a $1000 gift card. We will draw a winner this week! We’re giving away a thousand dollar gift card to a random person who has voted in the latest round of community. It’s the change you’ve asked for. Next Wednesday, July 8th at around 22:00 UTC, I’m going to find a random person on Hackaday.io. If that person has voted, they get $1000. If not, I’m going to choose someone who has voted and give them a $1000 gift card. It’s really that simple. If you vote in the current round of Community Voting, you have a good chance at winning a thousand dollar gift card for the Hackaday Store. What do you need to do to get in on the action? Go here and choose the most Amazingly Engineered project. You will be presented with two projects. Pick the project that is the more ‘amazingly engineered’ project. That’s it. That’s all you have to do. Show up and vote! Congratulations to everyone who has a project that was voted up to the top. Even though these rounds of community voting don’t decided which projects make it into the Hackaday Prize semifinals, you’ve earned the respect of your peers and a nifty Hackaday Prize t-shirt. Since NIRGM – Non-Invasive NIR Glucose Meter won last week, we’re moving down the list to #11 and awarding SciPlo a Hackaday Prize t-shirt as well. A New Round Of Voting! This week, we’re asking the Hackaday.io community to vote for the most Amazingly Engineered project entered into the Hackaday Prize. To entice everyone to vote, I’m going to pick a random Hackaday.io user next Friday around 22:00 UTC. If that person has voted, they get a $1000 gift card for the Hackaday Store. If that person has not voted, I’ll be giving a few prizes away to people who have voted. Last week, we gave away a SmartMatrix, an Analog Stepper Gauge, and a Simon Says kit. We’ll probably change that up this week; I don’t know what it will be, but someone who votes will get something. Imagine; giving away stuff just for clicking a button. How magnanimous can we get? As with every community voting update, it is requested that you vote. If you need a nudge to understand how this works, here’s a video tutorial on how to vote. For the last two weeks, we’ve been asking everyone over on hackaday.io to participate in the current round of community voting. We were asking everyone to choose the projects that were Most Likely To Be Widely Used. We just turned off voting for this round, and it’s time for round two: Which project is most likely to save the planet? No one won a $1000 gift card for the Hackaday store this week. In lieu of that, we’re arming the t-shirt cannon and aiming it at three random people who did vote. They are, in order of appearance, [Nick], [dbcarp], and [Eugene]. If you’re wondering about the results of this current round of voting and which projects the Hackaday community think are most likely to be widely used, hold tight. There are a lot of votes, and all that needs to be tabulated and computed and presented in a friendly graphical format. Also, it’s Friday afternoon. The winners of the first round of voting will be announced on Monday. It’s time for a new round of voting! This time, the theme is, Most Likely To Save The Planet. Voting is easy, just go over to the community voting page. You will be presented with two projects entered in the Hackaday Prize. 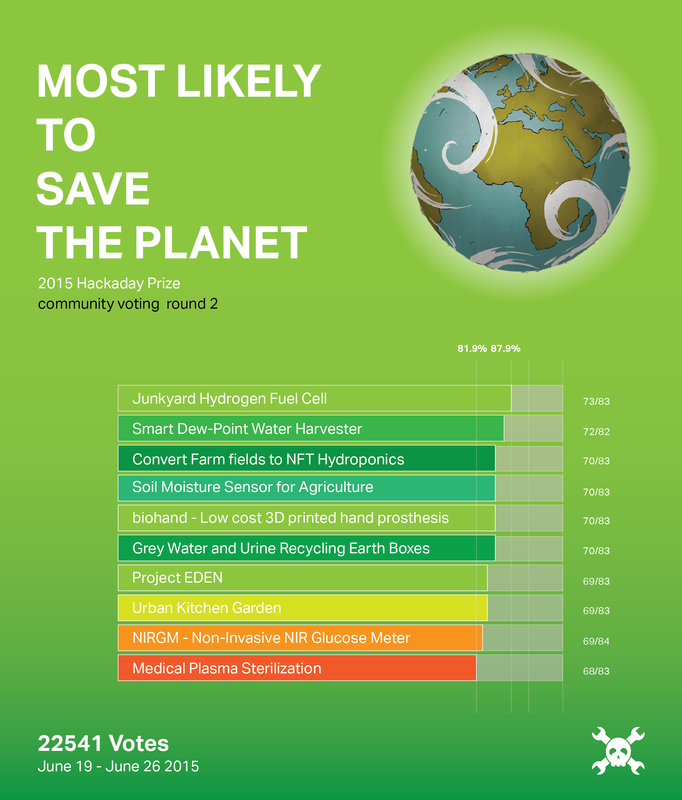 One of these projects will invariably be more likely to save the planet. It is your task to decide which one. Vote for the project that is more likely to save the planet, and you’re in the running for t-shirts or Hackaday store gift cards in the drawing next week. That’s all you have to do to vote in the Hackaday Prize community voting. Here’s a link to go do that. We’ll do the same thing next Friday afternoon – choose a random person on Hackaday.io, and if they have voted, they get a $1000 gift card for the Hackaday store. The only losing move is not to play, so go vote. Astronaut Or Astronot: Vote For The Hackaday Prize! Just in case we haven’t hammered it into your skull quite yet, we’re having a little contest over on Hackaday.io. It’s The Hackaday Prize, where everyone on Hackaday.io is invited to build something cool for the chance of winning a trip to space and hundreds of other prizes. We know not everyone has the desire, skills, or the time to build a project, but that doesn’t mean you can’t still contribute. We’re holding a community voting round right now. Each week, we have a new round of community voting with a new theme. This week, we’re asking the Hackaday.io community to select the project that is most likely to be widely used. What do you have to do to participate? Just go over to the voting page, and choose between two projects our especially fair voting algorithm pulled from current Hackaday Prize entries. Pick the project that best meets the theme of the week. Why would anyone want to do this? This Friday, I’ll be taking a look at everyone on Hackaday.io, pulling a number out of a hat, and if that person voted in the current round of voting, they win a thousand dollar gift card to the Hackaday store. We’re also giving away Hackaday t-shirts to random people who have voted each week. In case you’re not aware, we’re running a contest to send one lucky hacker into space. We’re already giving out $50k in prizes to entice the most worthy hackers to submit their project to the The Hackaday Prize. Now it’s time for community voting, and that means trotting out Astronaut Or Astronot, where you decide the best project for this week’s theme. Projects voted into the top ten for each theme will receive Hackaday Prize t-shirts. But there’s something in it for you too. Everyone who votes in the community voting rounds will be eligible to win a $1000 gift card to The Hackaday Store. This week’s round of community voting will decide which project entered into the Hackaday Prize will be the most likely to be widely used. Everyone on Hackaday.io gets 50 votes to pick the project that will be the most popular, most game changing, and most useful. Head on over to the voting page and spend those votes wisely. We’ll be doing a new round of community voting as often as every seven days. Everyone registered on Hackaday.io gets 50 votes for each round of voting, and every Friday (around 20:00 UTC), we’ll randomly select one person registered on Hackaday.io. If that person has voted, they get a $1000 gift card for The Hackaday Store. If they haven’t vote — nothing. So what do you need to get in on this action? Vote, obviously. We’ll be tracking which projects make it to the top of the list, and next week we’ll do it all over again. Enter your project now because we’re giving away a trip to space and hundreds of other prizes. Greg GothAck Miell liked USB-C-PD Soldering Pen for Weller RT Tips.